Objective: To investigate the influence of aging on conventional MRI and magnetic resonance spectroscopy (MRS) findings of mucopolysaccharidosis (MPS) patients and to test the correlation of enzyme levels, urinary glycosaminoglycans (GAG), and neuroimaging findings. Methods: Sixty patients with MPS types I (n = 8), II (n = 31), IV-A (n = 4), and VI (n = 17) underwent T2, fluid-attenuated inversion recovery (FLAIR), and MRS of the brain. For analysis of MRI variables, we measured the normalized cerebral volume (NCV), CSF volume (NCSFV), ventricular volume (NVV), and lesion load (NLL) on FLAIR using semiautomated and automated segmentation techniques. For MRS, a point-resolved spectroscopy technique was used. Voxels were positioned at the white and gray matter. Statistical analysis involved Pearson or Spearman tests for correlation between neuroimaging, age, enzyme levels, and urinary GAG. Results: The median age at onset of the disease was 20 months. 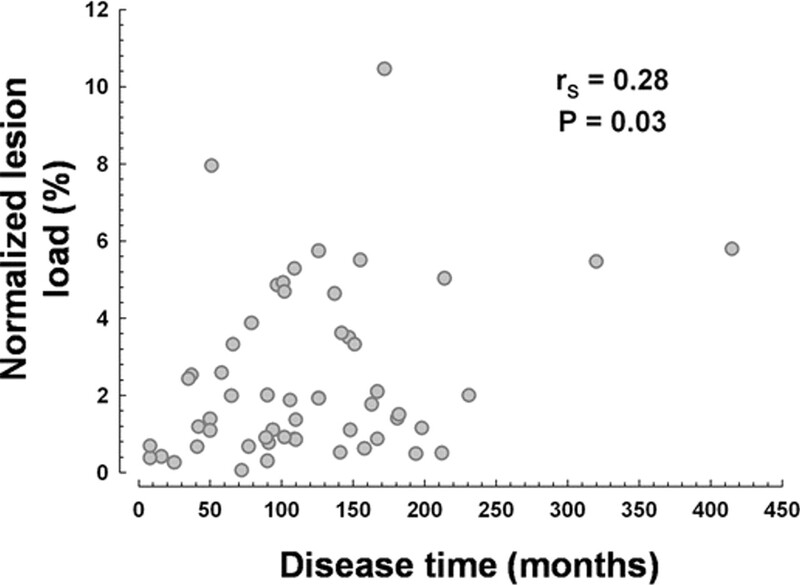 Patients with longer disease duration had more NLL in the white matter (r = 0.28, p = 0.03), and this difference was more pronounced in MPS II patients (r = 0.44, p = 0.02). Metabolites ratios in MRS, NCV, NCSFV, and NVV did not correlate with disease duration or age of the patients (p > 0.05). MRI and MRS variables in either the white or the gray matter did not correlate with enzymatic activity or GAG levels. Patients with MPS II had a lower mean NCV (p < 0.001). Conclusions: Our data showed that white matter lesion is more extensive as disease duration increases, especially in mucopolysaccharidosis type II patients. MRI and magnetic resonance spectroscopy findings did not correlate with either enzymatic or glycosaminoglycan levels. The management for MPS is changing, as new treatment options such as enzyme replacement therapy (ERT) and bone marrow transplantation undergo trials. For example, ERT is currently available for MPS I, II and VI.2–4 However, to achieve a good long-term outcome, treatment options before the onset of irreversible clinical symptoms will be an important goal. Markers of disease activity will be needed for early diagnosis, for prognosis, and to monitor therapy in MPS. MRI and magnetic resonance spectroscopy (MRS) have assumed an important role as tools to assist in the diagnosis of many metabolic disorders.5–7 Also, quantitative assessment of brain lesions is becoming an important consideration in monitoring the clinical outcome and treatment effects. The reason is because recent considerable advances in MRI have allowed the study of brain morphometrics in vivo, which can provide accurate, reproducible, and quantitative measures for assessing imaging findings, such as brain atrophy, white matter (WM) lesion load, and ventricular size. Recent advances in neuroimaging and image postprocessing have enabled largely automated measurements of cerebral, ventricle, and CSF volumes. Besides, combining the results of imaging studies with the results of molecular genetics improves the genotype–phenotype correlation and has the potential to enable a better understanding of the pathophysiology of the disease. Although such findings have been described for more than 20 years, evidence from these studies was based mostly on case reports or small series of cases, usually with a heterogeneous phenotype. Age-related changes of the magnetic resonance (MR) findings are controversial. Besides, the relationship between neuroimaging and biochemical findings has not been tested. In this study, we sought to investigate the age-related changes through neuroimaging and to test the correlation of MRI, MRS, and biochemical findings in patients with MPS. From August 2002 to August 2006, we selected all patients with MPS seen at the genetic department of our hospital. Of these, 70 patients with biochemical confirmed diagnosis of MPS were able to participate of this study. We excluded 10 individuals because of inadequate image quality for reliable postprocessing and/or patients who were unable to undergo the MRI (usually patients with respiratory compromise and clinically unstable). The remaining 60 patients were the study group (8 patients with MPS I, 31 with MPS II, 4 with MPS IV-A, and 17 with MPS VI). All patients with MPS I had MPS HIS or MPS IS. Of the MPS II patients, 17 had the severe form and 14 had the mild form. Forty-four patients were male and 16 were female. Each patient had typical clinical manifestations of the disorder, as well as a biochemical diagnosis of MPS confirmed by a deficient enzymatic activity (alfa-l-iduronidase for MPS I, iduronate sulfatase for MPS II, galactose 6-sulfatase for MPS IVA, and n-acetylgalactosamine 4-sulfatse for MPS VI) and increased urinary GAG. To exclude multiple sulfatases deficiency, a normal activity of at least one other sulfatase was necessary for MPS II, IV-A and VI. For MPS I and II, enzymatic deficiency was measured in leukocytes and plasma. Enzymatic deficiency for patients with MPS VI was measured in leukocytes. Thirty-one patients were receiving ERT (7 with MPS I, 16 with MPS II, and 8 with MPS VI; mean time of ERT treatment was 9.5 months). Age at onset was defined as the age at which the first clinical symptom was noticed. Age and disease duration at the first MR examination was also measured. Because the values ranges of urinary GAG and enzymatic deficiency vary according to the MPS subtype and age, for measuring the GAG urinary level (first sample of the day), we standardized the result using the higher number of the normal value range as the standard reference and divided the patient's GAG from this reference. For measuring the enzymatic level, we used the same approach but choose the lower number of the normal value range. The study was approved by the local institutional review board. Informed consents were obtained from the patients or their legal representatives before undergoing evaluations. All subjects were examined with a clinical 1.5-T MRI unit (Symphony, Siemens, Erlangen, Germany). The MRI protocol included acquisition of two transverse images obtained parallel to a line that joins the most inferoanterior and inferoposterior parts of the corpus callosum: 1) fluid-attenuated inversion recovery (FLAIR) sequence with repetition time (TR) of 9,000 msec, echo time (TE) of 114 msec, inversion time (TI) of 2,500 msec; and 2) T2-weighted images with TR of 4,000 msec and TE of 99 msec. The slice thickness was 5 mm, the field of view ranged from 180 to 230, and pixel size ranged from 0.45 to 0.55 cm. No paramagnetic agent was used. Single-voxel proton MR spectra were acquired at the same 1.5-T MR unit by using point-resolved spectroscopy technique (TR/TE: 2,000/30 msec). Automated shimming and chemical shift selective water suppression were used. Voxels of 8 mL were positioned at two locations containing mainly WM tissue at the deep right frontal lobe and at the gray matter (GM) in the posterior occipital cortex, across the midline (figure 1). To reduce measurement variability, partial volume effects with CSF or other brain structures, these locations are considered standard to research studies in our department. Software designed by the manufacturer (Siemens, Erlangen) was used to analyze peaks of N-acetylaspartate (NAA) at 2.01, choline (Cho), creatine (Cr), and myoinositol (mI). Integral values of mI at 3.56 parts per million (ppm), Cho at 3.25 ppm, and NAA at 2.01 were expressed as ratios to the Cr resonance intensity at 3.05 ppm. MRS postprocessing was performed at a workstation by two researchers in agreement (L.V. and M.K.) They were blinded to the age, type, and clinical status of the patients. Superimposed on an axial T2-weighted image, the white square shows the volume of brain tissue sampled by magnetic resonance spectroscopy at the WM (right frontal lobe) and GM (posterior occipital cortex). For analysis of MRI variables, we measured the normalized cerebral volume (NCV), normalized CSF volume (NCSFV), normalized ventricular volume (NVV), and normalized lesion load (NLL) in the WM on FLAIR. For preprocessing, segmentation and quantitative analysis, we used the ImageJ software (http://rsb.info.nih.gov/ij) from the NIH. This software has both semiautomated and automated segmentation tools (figure 2). Volumes were counted in voxels using the Voxel Counter plug-in of ImageJ software. For normalization, the outer table of the skull was defined as the peripheral edge of the volume of interest. Normalized volumes, which are corrected for different skull sizes, were used for statistical analysis. NCV was measured using a semiautomated segmentation technique. The method consists of an established seeded region growing algorithm in multiple regions of interest. The seeds are generated through manual specification of the structure of interest with a mouse. The borders of the skull and cerebral hemispheres were outlined using the Multi Cell Outliner plug-in (http://rsb.info.nih.gov/ij/plugins/multi-cell-outliner.html). We also apply a manual correction step to account for occasional misclassification of nonbrain areas. In some individuals with large skulls, the very superior or inferior regions (5 to 10 mm) were not included in the analysis volume. Importantly, because of normalization process, volumes are largely insensitive to incomplete coverage. NCSFV, NVV, and NLL were measured using an automatic segmentation technique. A two-step procedure was made. Using a local threshold technique, the analyzed structure was marked by a trained researcher (F.M.). For NCSFV and NVV, a transverse axial T2-weighted image was used. For NLL, a transverse FLAIR image was selected for measurement. The segmented structures were measured to obtain absolute total volumes. NVV measured only lateral ventricles values, so the III and IV ventricles were excluded. Statistical analysis was performed by using the software SPSS for Windows 12 (SPSS, Chicago, IL). Descriptive statistics, including the mean, median, and standard deviations of the clinical, biochemical, and imaging data were calculated. Age-related effects on MRI, MRS, and biochemical variables were evaluated using the Pearson (r) or Spearman correlation coefficient (rs), according to data distribution. For comparison between groups, analysis of variance with Tukey test for post hoc analysis or Kruskal–Wallis was performed, according to data distribution. The significance level for group comparisons and correlation tests was set to p < 0.05. Demographic characteristics, biochemical features, and MRI and MRS findings of the 60 patients are provided in table 1. Most had MPS II (51.7%). The median age at onset was 20 months (± 20.5). The age range of onset was 0 to 80 months, so all patients were younger than 7 years at the onset. The oldest patient was aged 38 years and had MPS IS. Half of the patients underwent the first MRI at age 10 years or older (percentile 50 = 121 months). There was no significant difference in age at onset or age at the first MRI between MPS types. Table 2 shows correlation of MRI and MRS with age of the patients and disease duration. 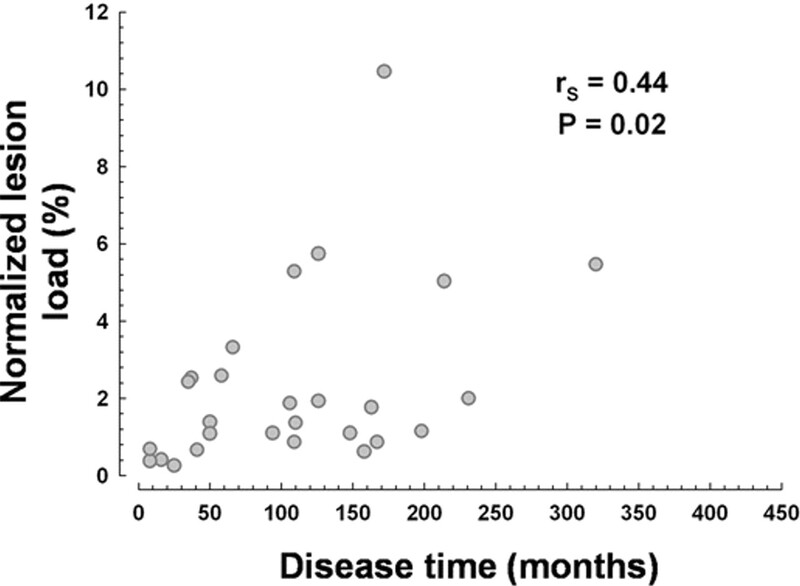 Patients with longer disease time had more NLL in the WM (rs = 0.28, p = 0.03; figure 3). This difference was more pronounced in MPS II patients (rs = 0.44, p = 0.02; figure 4) and did not change if ERT was or not used (rs = 0.37, p = 0.04 for patients without ERT and rs = 0.39, p = 0.04 for patients with ERT). NCV, NVV, and NCSFV did not correlate with disease duration and age of the patients (p > 0.05). There was no correlation of MRS metabolites (either WM or GM), GAG accumulation in the urine, or enzymatic level with disease duration or patient age. To explore the relationship between neuroimaging variables with biochemical findings, we assessed the relationship of MRI and MRS findings with urinary GAG and enzymatic level. MRI and MRS variables in either the WM or the GM did not correlate with degree of decrease of enzymatic level or GAG urinary level, even if the patient was on ERT or not. Table 3 shows correlation of MRI and MRS findings between subtypes of MPS. Because of the small number of patients, the MPS IV group was excluded for subgroup analysis. Patients with MPS II had a lower mean NCV (p < 0.001). There was no difference between the MRS metabolites, NVV, NCSFV, and NLSV and type of MPS (figure 5). 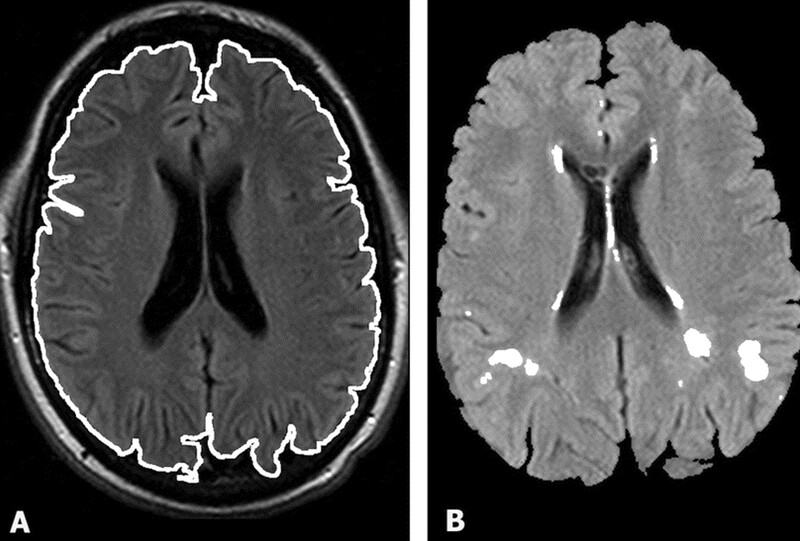 Examples of extensive white matter lesions on fluid-attenuated inversion recovery in patients with mucopolysaccharidosis types II (A) and VI (B). In spite of various descriptions regarding the MRI findings in patients with MPS, the evidence available are based on small series of cases, with heterogeneous samples of patients and without a serious criteria as to the appointment of subgroups.10,11,17–23 Besides, most of the variables were analyzed subjectively and no study used MRI quantitative techniques. To date, the correlation between neuroimaging, biochemical alterations, and neurologic symptoms is controversial. In this study, we evaluated MRI and MRS findings in 60 patients with MPS using semiautomated and automated segmentation techniques. As far as we now, this is the largest series describing such findings. The major conclusions are as follows: 1) WM lesion are more extensive as disease duration increases, especially in MPS II patients; 2) MRS metabolites, cerebral volume, ventriculomegaly, and CSF volume do not change with disease duration; 3) urinary GAG level and enzymatic level do not correlate with MRI or MRS findings; and 4) reduced brain volume is more pronounced in MPS II patients. Regarding demographic data, two interesting findings were observed. First, all patients had a disease age at onset below age 7 years. So we can conclude that most or even all patients with MPS are diagnosed before that age, mainly because the somatic findings are usually evident in young children. An exception could be MPS III patients (a group that was not included in this study), who frequently present neurologic findings but usually do not have severe somatic compromise at least during the first years of the disease. Second, most of the patient underwent the first MRI examination at age 10 years, rather late in the course of the disease. This is an important point to discuss because if MRI is going to be used as a tool to monitor disease progression or as a marker of treatment response, we need to perform these examinations earlier. The reason for this delay is probably the origin of most of the patients who came from many regions or countries far away from our center. In contrast to previous findings,24 our data showed a positive correlation of WM lesion and disease duration. The cause of this lesion is not fully understood. Histologic studies demonstrate gliosis, loss of axons, and myelin in the brain of MPS patients and animal models. Because extensive WM lesion is a frequent finding in many metabolic diseases, MPS should be differentiated from other leukodystrophies. Besides, because MRI variables including WM lesion seem to be a promising adjunct outcome measures in metabolic disease trials, the potential progressive behavior of WM lesions with aging is an important issue to be aware of. An increase of WM lesions with aging is also important because it shows that neuropathology in the WM could be a progressive phenomenon. Evidence from animal models showed progressive age-related changes. Current evidence suggests that ectopic dendritogenesis, neuroaxonal dystrophy, and death of neurons could be responsible for cellular dysfunction in MPS patients.28–30 In addition to GAG deposition, gangliosides (GM2 and GM3) also accumulate in the brains of MPS patients. It is interesting that ganglioside accumulation has been found in the brain of the MPS forms that present mental retardation.1 Although we cannot prove it in this study, we speculate that ganglioside accumulation could be involved in the appearing of WM lesions. Our data showed that MRS ratios, cerebral, CSF, and ventricular volumes were not age-related variables. This conclusion was based on normalized and automated MRI techniques to reduce potential confounding effects. As far as we know, these results have never been described previously in the literature. They are important because they indicate that brain atrophy and hydrocephalus could not be a consequence of aging. Maybe other markers related to genotype could also play a role in the development of these neurologic entities. This could be important to plan potential forms of treatment and to search for the cause of these conditions. Histologic studies showed that GAG accumulates in the meninges, and it is a potential cause of hydrocephalus.1 Comparing the GAG level with ventricular and CSF volumes, we thought to test this correlation. However, our data showed that increased urinary GAG levels do not correlate either with ventricular or CSF volumes. Although this negative relationship does not exclude the correlation, it is possible that other features are responsible for ventricular and sulci enlargement in these patients. For instance, venous hypertension could be one of these causes. We did not measure hemodynamic parameters in this study, but obstruction in cerebral veins is thought to be a cause of communicating hydrocephalus in children with skull base abnormalities.14 It has been postulated that ventricular enlargement results from diminished venous outflow through bone dysostosis of the skull base. Because skull base abnormalities and communicant hydrocephalus occur in MPS patients, this could be a potential cause of ventricular enlargement. New studies with measuring of venous flow (such as MR venography) could test this hypothesis. In our data, a lower enzymatic level did not correlate with changes in MRI and MRS variables. Because there is evidence that a lower enzymatic level is considered a marker of disease activity, we expected a positive correlation with some neuroimaging variables such as extensive lesions in the WM, a low NAA/Cr, and elevated mI/Cr at the MRS.24,25 However, we could not find such results. Correlations between patient genotype, amount of residual activity, and clinical presentation have been investigated for many lysosomal diseases, including MPS. Although residual enzymatic activity presents itself as a potential marker of disease, results from the literature are controversial.26 We speculate that besides the residual enzymatic activity, other findings, such as the type of the substrate and genotype profile, must contribute to CNS pathology.25–27 Brain atrophy is common in MPS, and the most compelling reason for measuring it is that it provides a marker of axonal loss, which, if progressive, is likely to result in irreversible disability.9,10,13,14 It probably represents neuronal death and myelin loss, although other entities, such as ectopic dendritogenesis, neuroaxonal dystrophy, and microglial activation, have also been described in MPS.28–30 Evidence suggests that brain atrophy is more common in MPS I, II, and III.9,10 Our data confirm that cerebral volume is lower in MPS II patients. The results found in MPS I patients were probably caused by the prevalence of the subtypes in our data. In this study, we included eight patients with the intermediate form (Hurler–Scheie) or the mild form (Scheie). None had the severe form of the disease (Hurler). A higher cerebral volume in patients with MPS VI is not surprising because mental compromise is not a frequent finding in this type of MPS. Evidence from series of cases suggests that WM lesions and hydrocephalus are more prominent in MPS IH and II.1,9,10 Comparing MPS subtypes, we did not find significant difference regarding WM lesions or ventriculomegaly in patients with MPS I or II from MPS VI patients. In some of the 17 patients with MPS VI, we found extensive WM lesions and ventricular enlargement. Although primary neurologic involvement has generally been considered absent, our data shows that severe WM lesions and hydrocephalus do occur in this subtype of MPS. Discrepancy between neuroimaging findings and clinical phenotype is seen in other metabolic disorders, such as Alexander disease, megalencephaly leukoencephalopathy with subcortical cyst, and leukoencephalopathy associated with congenital muscular dystrophy.13,14,31 Recently, Walkley et al.32 described abnormal lysosomal storage in neurons and glial cells of a feline model of MPS VI. The authors also could prove an abnormal amount of gangliosides (GM2 and GM3) in such cells. Previously, this substrate was found in neurons of patients with the most common forms of MPS (I, II, and III) that present mental compromise.1 Further studies are necessary to better understand the correlation of gangliosides, MRI findings, and neurologic compromise in children with MPS VI. The authors thank Mario Wagner, PhD, for consultation regarding statistical analyses. Received December 22, 2006. Accepted in final form April 4, 2007. Scriver CR. The metabolic and molecular bases of inherited disease. 8th ed. Vol 3. New York: McGraw-Hill, 2001:3421–3452. Harmatz P, Whitley CB, Waber L, et al. Enzyme replacement therapy in mucopolysaccharidosis VI (Maroteaux-Lamy syndrome). J Pediatr 2004;144:574–580. Hopwood JJ, Vellodi A, Scott HS, et al. Long-term clinical progress in bone marrow transplanted mucopolysaccharidosis type I patients with a defined genotype. J Inherit Metab Dis 1993;16:1024–1033. Kakkis ED, Muenzer J, Tiller GE, et al. Enzyme-replacement therapy in mucopolysaccharidosis I. N Engl J Med 2001;344:182–188. Wraith JE. Lysosomal disorders. Semin Neonatol 2002;7:75–83. Cheon JE, Kim IO, Hwang YS, et al. Leukodystrophy in children: a pictorial review of MR imaging features. Radiographics 2002;22:461–476. Faerber EN, Poussaint TY. Magnetic resonance of metabolic and degenerative diseases in children. Top Magn Reson Imaging 2002;13:3–21. Zafeiriou DI, Savvopoulou-Augoustidou PA, Sewell A, et al. Serial magnetic resonance imaging findings in mucopolysaccharidosis IIIB (Sanfilippo's syndrome B). Brain Dev 2001;23:385–389. Seto T, Kono K, Morimoto L, et al. Brain magnetic resonance imaging in 23 patients with mucopolysaccharidoses and the effect of bone marrow transplantation. Ann Neurol 2001;50:79–92. Lee C, Dineen TE, Brack M, Kirsch JE, Runge VM. The mucopolysaccharidoses: characterization by cranial MR imaging. AJNR 1993;14:1285–1292. Matheus MG, Castillo M, Smith JK, Armao D, Towle D, Muenzer J. 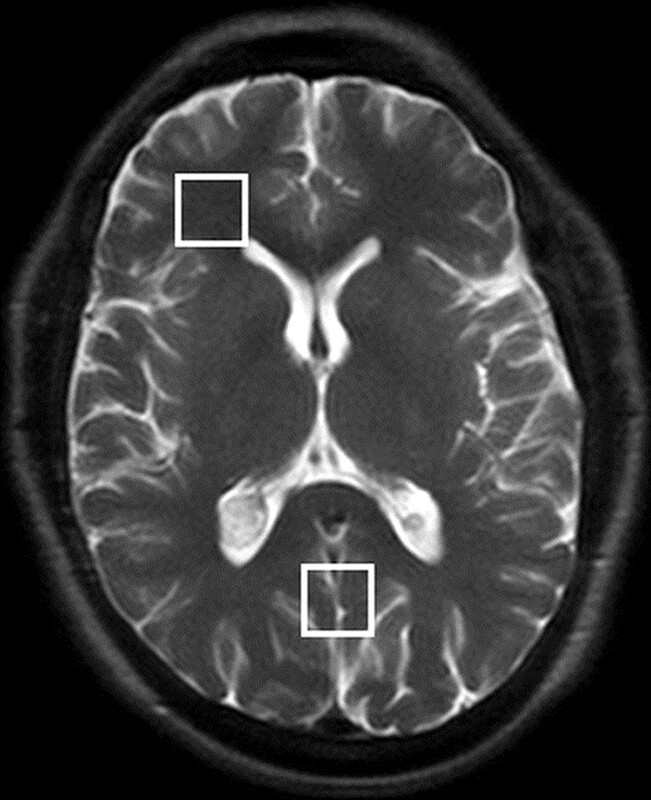 Brain MRI findings in patients with mucopolysaccharidosis types I and II and mild clinical presentation. Neuroradiol 2004;46:666–672. Gabrielli O, Polonara G, Regnicolo L, et al. Correlation between cerebral MRI abnormalities and mental retardation in patients with mucopolysaccharidoses. Am J Med Genet A 2004;125:224–231. Takahashi Y, Sukegawa K, Aoki M, et al. Evaluation of accumulated mucopolysaccharides in the brain of patients with mucopolysaccharidoses by (1)H-magnetic resonance spectroscopy before and after bone marrow transplantation. Pediatr Res 2001;49:349–355. Barkovich AJ. Pediatric neuroimaging. 3rd ed. Philadelphia: LWW, 2000. Barone R, Parano E, Trifiletti RR, Fiumara A, Pavone P. White matter changes mimicking a leukodystrophy in a patient with mucopolysaccharidosis: characterization by MRI. J Neurol Sci 2002;195:171–175. McGraw P, Liang L, Escolar M, Mukundan S, Kurtzberg K, Provenzale JM. Krabbe disease treated with hematopoietic stem cell transplantation: serial assessment of anisotropy measurements–initial experience. Radiology 2005;236:221–230. Taccone A, Tortori Donati P, Marzoli A, et al. Mucopolysaccharidoses: evaluation of the cranium by computed tomography and magnetic resonance. Radiol Med 1992;84:236–241. 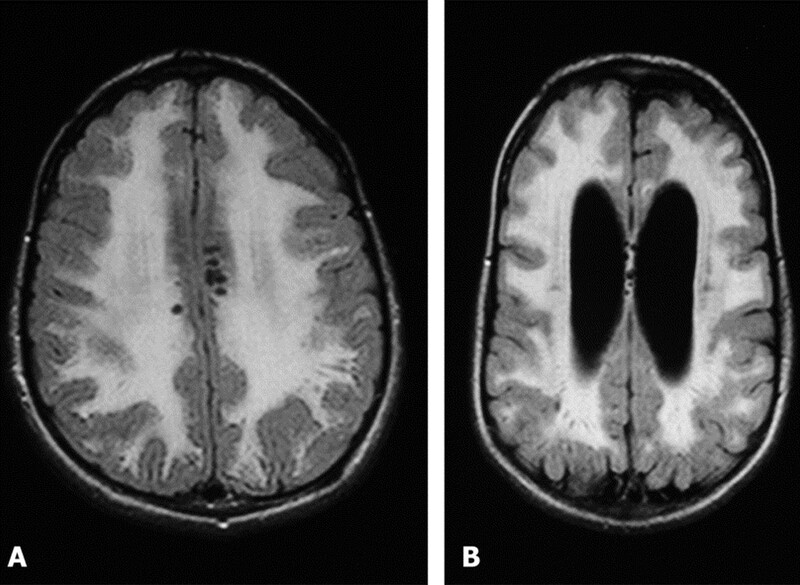 Shinomiya N, Nagayama T, Fujioka Y, Aoki T. MRI in the mild type of mucopolysaccharidosis II (Hunter's syndrome). Neuroradiol 1996;38:483–485. Sheridan M, Johnston I. Hydrocephalus and pseudotumour cerebri in the mucopolysaccharidoses. Childs Nerv Syst 1994;10:148–150. Murata R, Nakajima S, Tanaka A, et al. MR imaging of the brain in patients with mucopolysaccharidosis. AJNR 1989;10:1165–1170. Kulkarni MV, Williams JC, Yeakley JW, et al. Magnetic resonance imaging in the diagnosis of the cranio-cervical manifestations of the mucopolysaccharidoses. Magn Reson Imaging 1987;5:317–323. Dickerman RD, Colle KO, Bruno CA Jr, Schneider SJ. Craniovertebral instability with spinal cord compression in a 17-month-old boy with Sly syndrome (mucopolysaccharidosis type VII): a surgical dilemma. Spine 2004;29:E92–E94. Barone R, Nigro F, Triulzi F, et al. Clinical and neuroradiological follow-up in mucopolysaccharidosis type III (Sanfilippo syndrome). Neuropediatrics 1999;30:270–274. Parsons VJ, Hughes DG, Wraith JE. Magnetic resonance imaging of the brain, neck and cervical spine in mild Hunter's syndrome (mucopolysaccharidoses type II). Clin Radiol 1996;51:719–723. Fuller M, Rozaklis T, Ramsay SL, Hopwood JJ, Meikle PJ. Disease-specific markers for the mucopolysaccharidoses. Pediatr Res 2004;56:733–738. Fuller M, Brooks DA, Evangelista M, Hein LK, Hopwood JJ, Meikle PJ. Prediction of neuropathology in mucopolysaccharidosis I patients. Mol Genet Metab 2005;84:18–24. Azevedo AC, Schwartz IV, Kalakun L, et al. Clinical and biochemical study of 28 patients with mucopolysaccharidosis type VI. Clin Genet 2004;66:208–213. Savas PS, Hemsley KM, Hopwood JJ. Intracerebral injection of sulfamidase delays neuropathology in murine MPS-IIIA. Mol Genet Metab 2004;82:273–285. Ohmi K, Greenberg DS, Rajavel KS, et al. Activated microglia in cortex of mouse models of mucopolysaccharidoses I and IIIB. Proc Natl Acad Sci USA 2003;100:1902–1907. Ferrer I, Cusi V, Pineda M, Galofre E, Vila J. Focal dendritic swellings in Purkinje cells in mucopolysaccharidoses types I, II and III: a Golgi and ultrastructural study. Neuropathol Appl Neurobiol 1988;14:315–323. Dinopoulos A, Gorospe JR, Egelhoff JC, et al. Discrepancy between neuroimaging findings and clinical phenotype in Alexander disease. AJNR 2006;(27):2088–2092. Walkley SU, Thrall MA, Haskings ME, et al. Abnormal neuronal metabolism and storage in mucopolysaccharidosis type VI (Maroteaux-Lamy) disease. Neuropathol Appl Neurobiol 2005;31:536–544.